I was just pulling off some photos from the old SD card, organizing them on the computer and thinking, "I really do have cute kids." Those Names Are for the Dogs! Some of the mothers of the second graders gathered at school this afternoon to throw a surprise baby shower for Elisabeth's teacher and her class. What a fun, little way to wrap up the week! I think her teacher was pleased; I know the kids were-- they were bouncing off the walls. It was a very short, simple event: We had each student personalize a bib for the baby, gave her a group gift and had the most beautiful cake. We also had all the children sit down and offer advice to their teacher, things they know about babies that maybe she does not yet. A little girl offered, "It might take like a week or two or three days for the baby to be born, so you should just be patient." One boy offered his baby brother peed in the tub... and then his mom washed the baby's hair with that water! Another boy said, "Never take a baby anywhere!" Numerous children suggested pacifiers as a way to quiet the baby-- all the time. They also relished the opportunity to use words like "barf" and "fart" in the classroom. Our most loving wishes to this young family, with prayers for calm minds and hearts at this time, a textbook delivery, a healthy mom and a healthy baby. p.s. 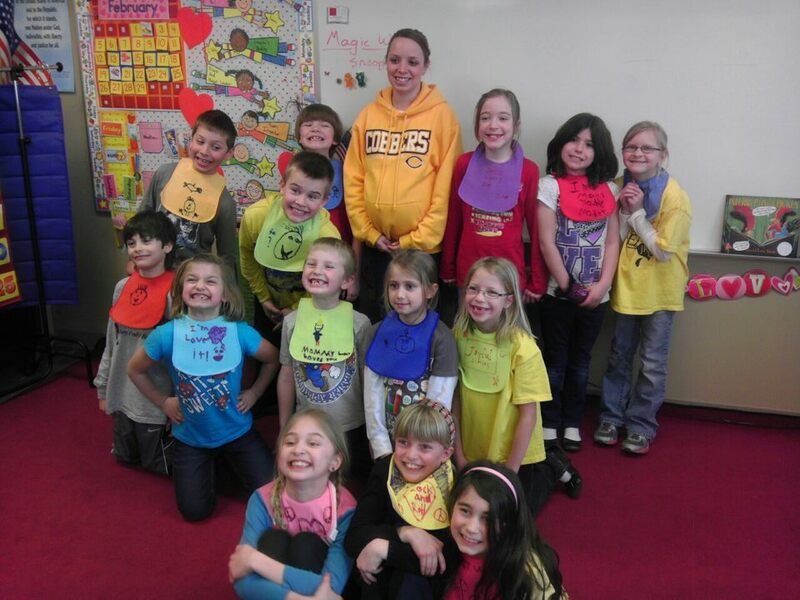 Libby's bib reads, "Joyful Times!" I started thinking about those developmental milestones in children, and how all parents know certain benchmarks... because we read about them in the parenting books. My brother and SIL have started asking things of 13-month-old Lucia, and she has begun to respond-- correctly. They say things like, "Where's the cow?" or "Bring me your cup." Sometimes Lucia even does as they say. Then, I started thinking about how two-and-a-half-year-old Madeline has mastered multi-step commands: "Pick up Libby's glasses, take them downstairs, hand them to her, and tell her the next time she forgets them she has to pay a dollar." But those are all objects she knows, and that exchange is part of our usual household routine, so it would be very familiar to Maddy. Just for fun... and because the rabbit-and-frog toy wouldn't sing "At the Hop"... and truly because I was too exhausted to lift my rear from the couch cushion, I issued a challenge, telling Madeline: "Go find me three AA batteries and a small, Phillips screwdriver and we'll fix this bunny." Now, I knew full well that she didn't know a AA battery from a D battery, nor a Phillips screwdriver from a woolly mammoth. To my surprise, Madeline took off for the part of the house in which the battery box actually resides. After some time, she returned, with: nine AAA batteries; a beaded bracelet; a small, plastic bucket; and a large, stuffed duck; and without her clothing. I'm not sure where that puts her along the developmental continuum, but, in Krinkeland terms, she's just as weird as the rest of 'em. Right now, Madeline is in the lots-of-talk-but-no-action stage. She discusses going in the potty chair all the time. She talks about wearing underpants and going to Chuck E. Cheese, Grandma and Grandpa P.'s reward for being trained. We have to visit every toilet we see; she is especially fond of the potties at Target and the girls' school. But, she sits and she sits, and nothing happens. Luckily for Maddy, she has a new coach in her corner: Benjamin has appointed himself the Toilet Trainer. He sits in the bathroom with that girl for long stretches of time, keeping her company, reading her stories and giving her tips. He uses terminology like: "let the gate open," "make a turd as big as a bear" and "don't flush when the toilet is going 'hhhshshshmmm.'" Ben also frequently demonstrates going, hoping to inspire his younger sister, so I figure when Maddy does finally decide to go, she will do it standing up. While working on the computer, I could hear Benjamin playing by himself in the toy room. 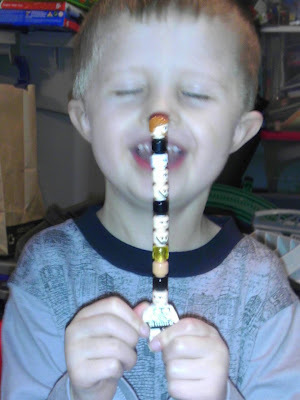 He was singing a song that sounded like, "I have 13 heads... I have 13 heads..."
There's no better playmate than a Lego guy. After spending much of the day at home, I packed up the kids for a late-afternoon errand. When we got to the store, the weather was balmy enough that Benjamin was swinging his jacket above his head. When we were ready to leave, it was snowing so hard we couldn't see across the parking lot! As we stood in the entryway, bundling up, an older man turned to the kids and fake-scolded, "SNOW! Did YOU order this?!" The kids, in unison, giggled and said, "YES!" It has been such a crazy winter-- Elisabeth commented, "Well, we didn't get a white Christmas, but maybe a white Ash Wednesday." Of course, to go along with the new snow, all the drivers on the road forgot how to drive. So, it took an hour to get home and I wished we'd never left. The one bonus was I discovered my new car has heated side-view mirrors. Nice. I have my nighttime plans set: I'm going to watch the Season Two Season Finale of "Downton Abbey" on PBS. OK, it's already on... so I'm really going to watch the recorded version-- just have to wait till all the kiddos (and hopefully the hubby) are in bed so I can watch it uninterrupted. Have you seen this show? If not, why the heck not?! It is sooo good. And, this is coming from a woman who thinks-- and even says-- ridiculous things such as, "Ugh. I hate all that historical crap. It's so boring!" The family home for the Earl of Grantham is Downton Abbey. That's where the show takes place, in rural England, in the early 1900s. The premise is that the Titanic has just gone down, taking with it the earl's only two known male heirs. So, what is to come of the property and the earl's family? The first season took us up to the beginning of World War I. In the second season, the war continues... and then ends... all while many other "battles" are brewing for the aristocratic family and also amidst the separate side stories of the servants of Downton Abbey. It's a really cool show. My friend Alicia got me hooked during a visit this summer. I, in turn, have hooked many others. Meantime, my SIL and MIL and her husband were all already hooked in their own right. So, I can't wait to find out what happens tonight. And then, I will have to wait for the next season. Until then, I'll just have to keep busy with my "Downton Abbey" paper dolls, discovered by another hook-ee, my friend Beth. Amanda: "Mom, when I grow up, I'm going to marry a really smart nerd." Amanda: "Yeah, 'cuz they're the ones who make all the money." Amanda: "I mean, look at Dad-- he made enough money for us to live in this big house, and we even got to take a trip to Disney World. Disney World, Mom." Mom: "Well, Amanda, I think you are too young to be concerned with who you are going to marry. More importantly, those are not the criteria for making such an important decision. I did not choose your daddy because of his intelligence or his earning potential. You don't marry for money." Amanda: "Oh, I know. That's called being a 'gold digger.'" Amanda: "When I first heard that word-- gold digger-- I thought it meant someone who picked his nose. But, then, I heard people talking about it on TV and I figured it out." I was driving down the road when I saw arms waving in my rearview mirror and realized Madeline (a.k.a. Houdini) had managed to wiggle out of the top two points of the five-point harness in her car seat; she was reaching for the overhead reading light and climate controls. "Sit down and put your seat belt back on," I said. "Maddy, sit down and buckle up!" Then came a little voice from the back seat: "You don't have to yell at me, Mommy." Today is one of those days when I begged Todd to change places with me. It doesn't happen often. While I believe in my heart he would last about 10 minutes as a stay-at-home parent (well, he might last a lot longer, but the kids and the house would be done-for) he does like to give me jabs about "living the good life." And, while there is the down side (barf, whining, picking up others' messes, finding others' stuff,) there are some perks (long lunches, shopping when the stores aren't busy, sticky kisses) so, I try not to complain too much. I really only get revved up for days that seem unbearable to me: when I have to take all four kids to the dentist by myself, when Benjamin and I visit the geneticist, when a new repairman is coming to the house. Also in that category: taking my kid to the funeral of another kid. Elisabeth and I attended seven-year-old Hayden's funeral this morning. I wouldn't say attending a funeral is something to which any of us looks forward. If we are honest with ourselves, funerals are scary because they force us to realize our own mortality and to re-examine our relationships with God. Funerals make me feel weak-- weak in faith, poor in spirit, emotionally frail. "But, I'm not ready, Lord," I silently cry. There had been no definite plans to witness the celebration of Hayden's little life. While I certainly recognize parents' and grandparents' faces from around school and school events, we do not personally know the family. He and Libby were classmates... And there were some cute stories about Hayden hanging around the lunch table, keeping his eye on our Libby. We went to the funeral, my daughter and I, because she asked if she could go. Now, I don't claim to have all the parenting answers, but, for good or for bad, I have made it a practice to try to shield my children from unnecessary pain and heartache. Yes, death is a part of life and I believe they need to know that reality. However, we are fortunate to have all of our close family members and friends still with us. With our children still being young, Todd and I have felt it's best to leave them home when attending the funerals of our own aunts or uncles, cousins, and others. This is the first funeral Elisabeth has ever attended. We went early and parked outside the church so I could explain what was going to happen and answer her questions. She had questions-- about who would or would not be there, if it would be like "normal" church, if there would be food. My favorite questions were: "Whoa! What's that cool car? Is it a limo? Who gets to ride in it? Can anyone buy one from a regular car dealer?" Yes, it was the hearse. She wasn't too sure about standing in the visitation line, and didn't want to talk to Hayden's mom and dad. But she had written out a card, and we signed the guest book and looked at the many, many photos of the adorable boy. We took seats in the church, prayed, and watched as the throngs of mourners came to pay their respects. There were so many people lined up, they were finally asked to take seats, so the funeral could begin about 10 or 15 minutes late. The songs got me. The readings got me. Hayden's sweet face, grinning up from the service program, got me. The faces of the other mommies got me. My daughter's head, resting against my arm, got me. "But, I'm not ready, Lord." It's a beautiful and humbling, but challenging, call for me to remember my life is His; my children are His; the plan is His. Our priest shared a wonderful message. He did not have all the answers-- he said so himself. But he talked about a little boy, with a huge grin and mysterious pocket contents and a passion for "fart putty." When Hayden's dad delivered his eulogy, he reaffirmed the boy's image as inquisitive, tender, and funny. He also reminded all of us how Hayden loved to dance. I remembered I had that on video. I won't need to explain which one he is. ...we can still be pleasantly surprised by unexpected things. ...I got to have a Valentine's Day dinner with my two favorite guys. ...every time we drive around the lake, Madeline comments, "They building a new house. It huge." ...my friend made us supper after hearing me complain I have no time to cook. ...my goddaughter is more thrilled with balloons than any other possible gift. ...we have so many excited, dedicated, well meaning volunteers working with Saints on Stage. ...Benjamin was over-the-moon happy to spend Valentine's Day with his adaptive phy. ed. teacher. 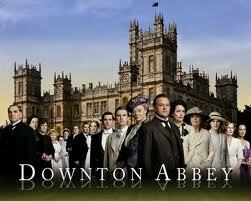 ..."Downton Abbey" just keeps getting better and better. ...I get to snuggle next to my Valentine every night. It's been a day of highs and lows... as life is, I guess. 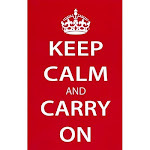 I learned this evening that the sister of a long-time acquaintance had died. She only recently got her cancer diagnosis, and had been such an optimistic fighter. Please keep Chris and the whole family in thought and prayer upon the death of his sister, Anne. I have also been anxiously following the travel/baby blog of some good friends who are having their second child "by airplane." 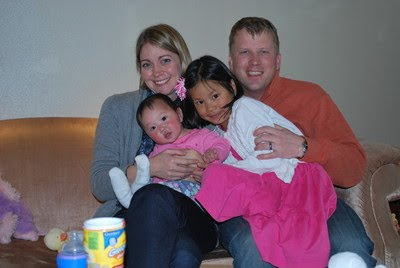 I know you, too, share in the joy of this new family addition for Alicia, Erik and Annie. Welcome, Nora! Broadway-bound? Maybe not yet, but remember-- she's only two... And she built the Lego candle all by herself. 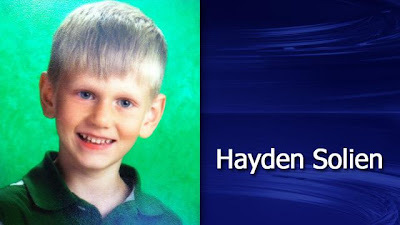 Our thoughts and prayers go out to the family of Hayden Solien. The seven-year-old boy, a former classmate of our Elisabeth, was struck and killed by a car this morning while waiting at the school bus stop. There is no understanding of something so senseless... and it is a difficult conversation to have with children. One of the many questions I am hoping to get answered in glory one day. The older I get, the less I say. Yes, I am referring to a topic on which I have previously written-- when it is better to keep one's mouth shut, which is often. But, I also mean just not responding... even when I'm right... especially when I'm right. It's not that I don't have a strong opinion about absolutely every topic under the sun-- I do. It's not that I don't feel as passionately about things as I once did. It's simply that I no longer care about convincing others to see things my way. I rarely feel the need to defend my actions or my views. I don't see much point in beating others over the head with my evidence or ridiculing them for taking a different stance. I don't much care if people like me. This is not to say I wish for people to dislike me; that never feels good. And I screw up a lot. I certainly do need to open my mouth to apologize, pretty much every day. But, if people don't like me, or if they don't accept my apology, or if they don't see the good I'm doing as a positive thing... Well, then, what can I say? What should I say? That's right-- nothing. And, yes, you guessed where this was going: It would be nice if you would shut your trap, too. What do you mean? I am keeping my mouth shut. Lips sealed. Locked tight, key thrown. I typed this instead. Stalling at bedtime, Benjamin and Madeline ducked into the toy room to play school. Maddy loaded up a backpack with story books, hefted the straps onto her shoulders, waddled back into my room and, waving, said, "Bye, Mom, I doh to shool now!" "Wait!" I called after her. "Not yet-- you're too little to go to school! Don't you want to stay here with me?" No, I really was not kidding. Her words shot me in the heart. I couldn't imagine my baby going off to school... we still have years, don't we?... and I wanted the toddler to know her little game was not funny. Madeline turned back around and walked to where I was sitting. She grabbed my face in her chubby, little hands, looked me seriously in the eyes and said, firmly, "I go shool now. Dis peeshool. Li'l bit. I be home soon." With that, Maddy turned and marched out of the room. Out of my life. Leaving me. Alone. And it's going to happen... just like that... in a moment's time. We've had a busy weekend, as so many are. My mind has been racing in so many directions, I've neglected to post this important headline: Elisabeth scored her first goal in a basketball game! Yep, those skinny, little, bird arms just hefted that big, orange ball into the air and... SWISH! Takes me back, takes me back to that singular basket I ever scored in my short and unremarkable basketball career. In my case, it was definitely rigged. (Helps to have your daddy be the coach.) My green, striped tube socks were the greatest thing about my hoops days. Congratulations, Libby the Great! Mommy is so proud of you! "You and I go hand-in-hand, Valentine." and the standard "Be My Valentine"
Ah, Sweet Girl... This child has a heart of gold, but is very dedicated to making sure she is never misunderstood. She is oh-so-nine-years-old, and truly would not want to be mistaken for one of those "silly girls" who is already "crushin' on" boys. It's one of the many reasons I love Amanda so. She can be my Valentine, any time. I can't believe at one time I was concerned about Madeline's lack of speech. The girl never shuts her trap. True, she is sometimes still a little bit difficult to understand, but, just this morning she told me, plain as day, "Mama, I have a booger stuck in my nose." A mother's pride. Then, she had an argument with her godfather about whether Lucia was her cousin, or she was Lucia's cousin. (Maddy didn't think it could be both.) Yes, my toddler is speaking; yes, my brother is arguing with a two-year-old. Madeline has an interesting vernacular, however, and still says some really strange approximations of words. For example, her cousin Lucia is "Baby Shushee." She begs to go to "McDahWhoa's." The one that really gets me is Wal-Mart-- for reasons I cannot figure it out, Maddy calls it "Home-Work." When we drive by, she points and whines, "I wanna go to Home-Work." I tell her, "No, Maddy, we don't go to Wal-Mart unless we don't have a choice. We can go to Target."